Comments Off on Gut Feeling vs. Real Data – How Did Last Year Go? Looking back at last year, you may have a gut-feeling about how the year went. Relationships with suppliers may have been smooth and predictable, fluctuating production activities were easily weathered, and you may expect financial reports to show a profit. However, in the real world things may not have gone quite as well as you thought, especially if your business is managed with entry-level or disparate, specialty software programs. Many business use weekly meetings or written status updates to bring to light important customer interactions, product quality issues, or other business activities. Discussing these noteworthy events can be beneficial but it simply isn’t an accurate representation of what is happening within your enterprise. If you are using disparate software solutions, it could take even longer to learn about problems with customers or products, which can lead to even bigger problems down the line. You can’t be everywhere at once or be aware of every glitch or setback, but with the right software you can. An enterprise resource planning (ERP) solution can provide greater insight into your business operations and is more reliable than the traditional weekly meeting. A solution, such as Microsoft Dynamics® GP, integrates all of your core business operations into a single software solution, connecting financials, supply chain, inventory, manufacturing, and distribution activities, as well as human resources and payroll. You can use the RoleTailored interface to put the data you need the most, literally, at your fingertips. Monitor sales figures, inventory levels, or customer feedback from the convenience of your own computer and, in many situations, on mobile devices. You can have greater insight into your supply chain, for example, and be better prepared to respond to the inevitable supply chain interruption. You can also keep tabs on budgets, spending, labor productivity, and sales figures in real time and use this real time data to make sure that business operations are on the right track, trending toward healthy profit margins. You may feel like you had a good year but what did the numbers actually show? A gut-feeling isn’t good enough for banks, shareholders, or for you to use when creating strategic plans for growth. Contact Sherwood Systems for more information about using ERP and have confidence that your business is headed in the right direction. 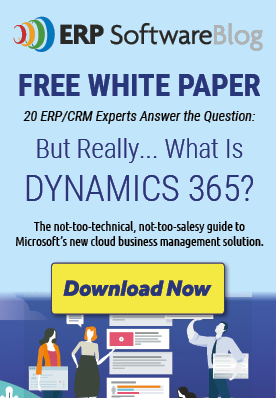 Posted in About Microsoft Dynamics GP, Dynamics ERP for Distribution, Dynamics ERP for Manufacturing, ERP Software Information, Financial Reporting, Microsoft Dynamics GP 2013 | Comments Off on Gut Feeling vs. Real Data – How Did Last Year Go?